Gallerie Aube, where Akita and went to see the Tanaami Keiichi show, happens to be located right inside Kyoto Zokei Geijutsu Daigaku, where Akita’s girlfriend Takei Ai, a ceramicist, studies. 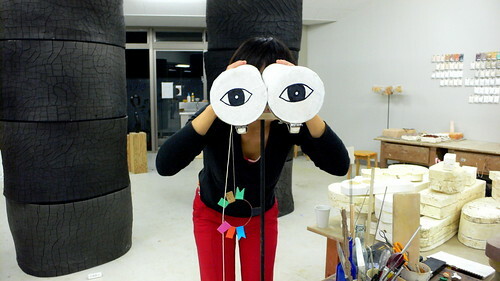 Just by coincidence, it happened to be a day of open studios and so Akita and I met Ai up at the hillside studios and we wandered around looking at what graduate students are up to these days in the Kyoto art world. Of course, since the KZGD is an art school, there’s work everywhere. 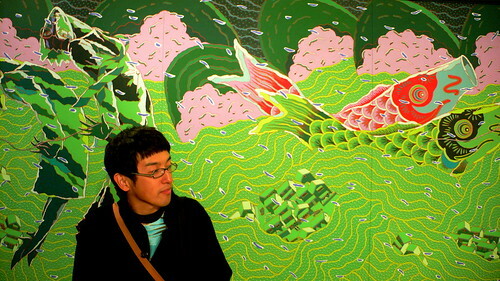 Here’s Akita standing in front of a particularly vibrant carp painting. 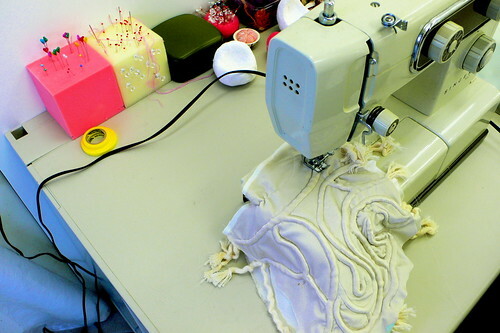 The first few studios we wandered through featured artists who were working with fabric. Unfortunately, none of my photographs really convey the ‘fabricness’ of the cloth-based art. 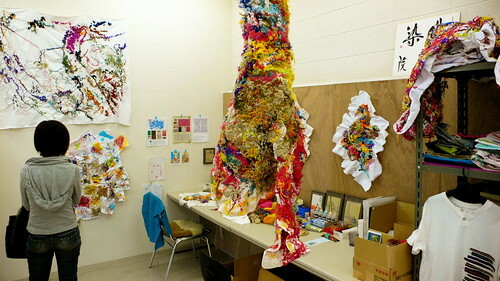 Somehow fabric art manages to be sculptural, yet with a softer boundary between viewer and work. Perhaps because we wrap ourselves in cloth every day, cloth as a material has a sense of familiarity about it — or even hominess — that other materials can’t reproduce. Cloth-based art also feels less academic than other forms of art — it’s as if the lack of a proper history of lycée discipline allows it a freedom that sculpture and painting can’t escape. Someone left this workspace in its ‘in-use’ phase so that viewers could get a sense of the work that goes into texturing fabric. 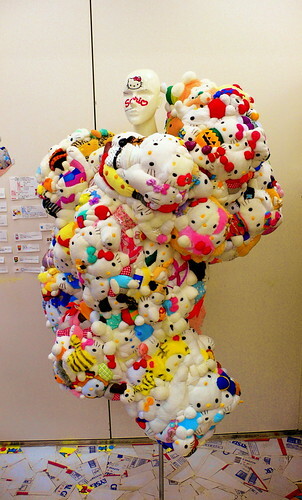 One of the most stunning and hilarious pieces of cloth art on display was this Sanrio based ‘cloak’ composed entirely of Kitty Chan dolls. In fact, I’ve run across images of this piece somewhere before — but I can’t remember where. Perhaps it was in one of the many Japanese street fashion mags (such as Fruits) that it’s pleasurable to leaf through from time to time. Akita said that he had seen some of this artist’s older work before, and that she (I think ‘she’) was beginning to make a name for herself. What the artist’s name might be, however, I have no idea. I was a terrible reporter at the scene of the open studios and didn’t jot down a single note recording the names of the people responsible for all the great work that I was being introduced to. Shame on me. 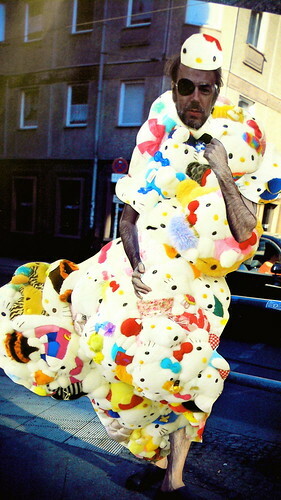 It was a nice surprise, however, to come across this collaged image of Momus parading through the streets bedecked in Kitty Chan. Momus was in good company as well — in addition to Momus, the artist had also garbed the Mongolian sumo wrestler Hakuho in Kitty Chan wear, and the Emperor himself (seen at the top of this entry). I’m not sure if there was a ‘theoretical basis’ for this work, but the artist was clearly interested in making paints and pigments using various types of bread. 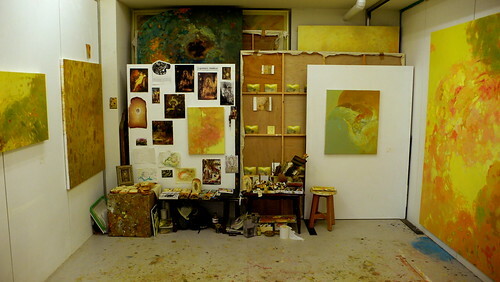 If you view the magnified image, you can see several loaves of bread arranged in the workspace. The bread paintings (including a painting of bread) had lovely coloring and texture — very organic and warm. Dare one even say, toasty? Here’s a close-up of the bread pigments. I’m not sure if these tubes actually held bread pigment, or if the bread was mixed with paint, or what. 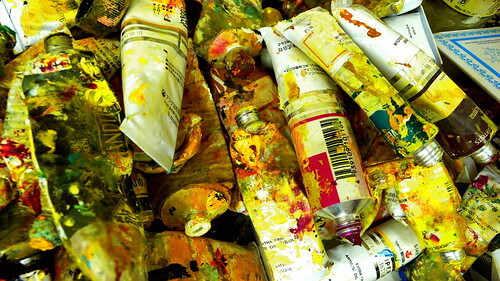 But bread and painting — definitely. This painting was one of several neo-nihonga style paintings. 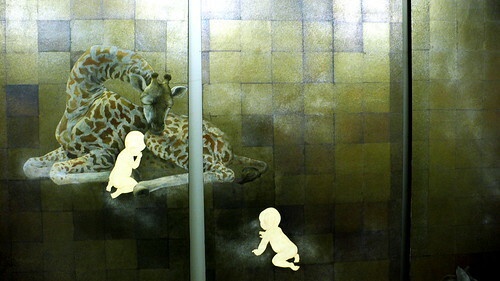 I especially liked the strangeness of the mother giraffe caring for the human infants. Many of the neo-nihonga works that I saw were similar to this piece — surreal, thematic modifications of traditional Japanese painting — but others seemed to be taking the tradition more seriously, adding contemporary stylings in a low-key manner to let the traditional speak, but speak an originality as well. This sculptor was certainly having fun with the idea of Pygmalion’s living statue. Here, instead of the sculptor breathing fleshy life into marble, the sculpture is carving itself, the tools of production visibly scattered around on the floor. 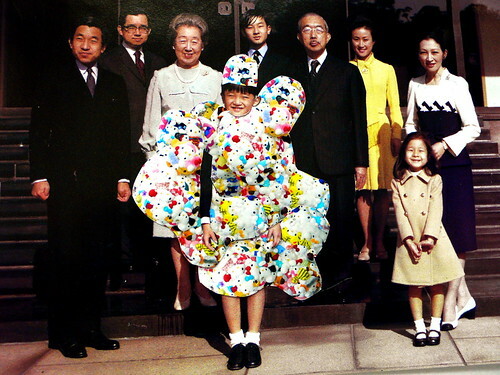 A commentary on Japan’s new woman? Or just a bit of coy cleverness? 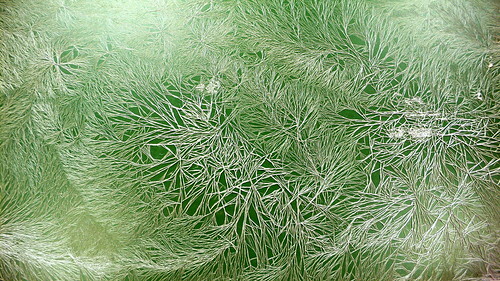 I’m not sure how this delicate and beautiful crystallization technique was achieved, but this is what it looks like when applied to the smooth surface of a green tabletop. And here it is again, applied to a spoon. It was also applied to a Japanese Zero and a plastic toy horse, but they were more difficult to capture on film. Here’s Takei Ai with her wonderful trick binoculars. When you pull the string hanging to the left, the eyes at the front flap open, trap doors in the tubes pop open, and large quantities of folded geometric paper figures come streaming out. It’s a comedic surprise — as if you’ve tricked yourself by looking outward, because all of the good stuff is inside. Here are some pieces by Ai. 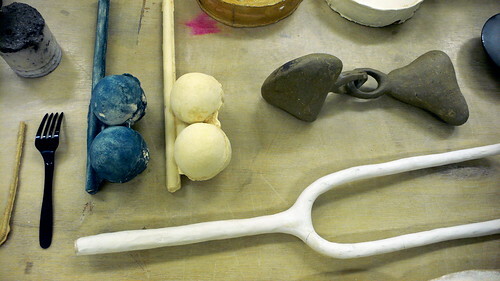 She calls these pieces “oyster collaborations” (my translation — I think a proper translation should be “clam collaborations”) because she uses molds to make these pieces rather than shaping the clay by hand. This results in seams and patinas that mark the work and its process. 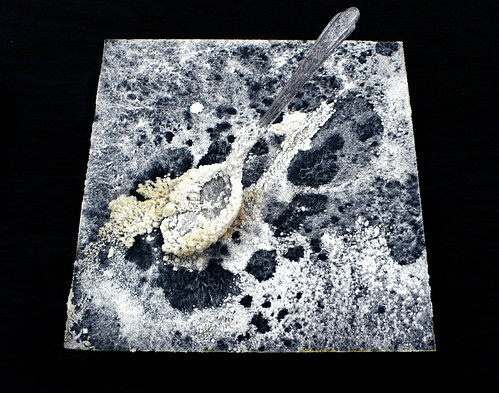 The empty molds sit arranged in piles around the workplace, remaining as a negative space — the inverse twin of the product on the display table. Ai’s hobby is making pop-up cards. 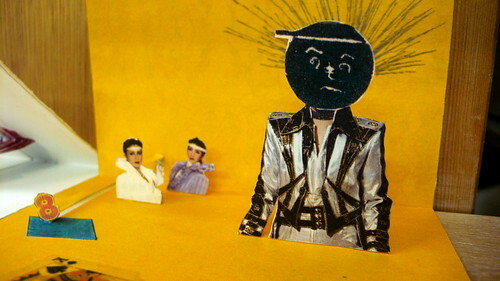 She showed me two different series of pop-up cards, each of them stylistically distinct. There’s so much delight in a pop-up! Especially so when there’s even more aesthetic surprise made available because the pop-ups are removed from any storytelling context. This one appears to involve the Takarazuka stars from Rome at Dawn, as well as an enormous black-sun headed Taka tuxedo star. I bet you weren’t expecting that when you opened it! 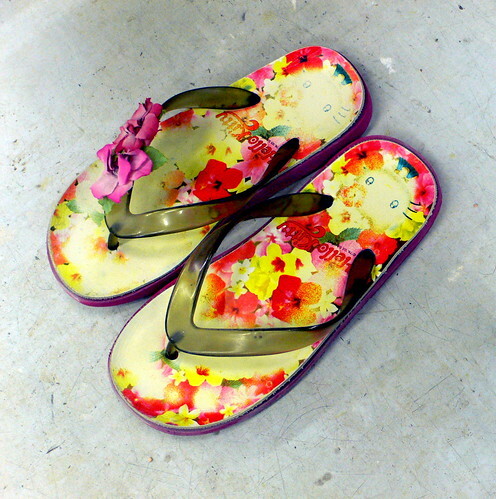 Finally, one of my favorite pieces at the KZGD open studios — Ai’s Kitty Chan flip-flops, in all of their found-object, oversaturated glory.